Arunachal Pradesh is situated in the north eastern most part of India and is nearly 84,000 Sq. Km in area. It has a long international boundary with Bhutan to the west (160 Km), China to the North East (1080 Km) and Myanmar to the East (440 Km) stretching 1,680 Kms of international border. The Department is, at present headed by Secretary, Trade & Commerce, Govt. of Arunachal Pradesh. The Department of Trade & Commerce is the Nodal Department for issue of Trade Licences. All the respective Deputy Commissioners/ ADCs of the Districts have been empowered to issue Trade Licences up to Rs. 10 lakhs. Trade Licences involving more than Rs. 10 lakhs are also issued by the respective DCs after thorough examination by the Department of Trade & Commerce and subsequent approval of the Government. Normally, Trade Licences are issued to Arunachal Pradesh Scheduled Tribe (APST) entrepreneurs only. However, in exceptional cases where there is no APST entrepreneurs forth coming, Non-Tribals are also issued Trading licences with the approval of the Government subject to dully recommended by the respective DCs as a special case. Moreover, trade licences can also be issued to industrial unit established by other than APST as per Arunachal Pradesh State Industrial Policy 2008. The other guidelines for issue of trade licences are given at Appendix-IV. Trade license fees are approved for 311 trade items. The list is available at Annexure 'A'. By the advent of globalization and economic liberalization, The Government of India has given more emphasis on the development of Border Trade & Foreign Trade with the neighbouring countries for the overall economic development of the state in particular and country in general. As a consequence, the Government of Arunachal Pradesh has taken up some ambitious proposals for re-opening of border trade with the neighbouring countries i.e. Bhutan, Myanmar & China. In the past, the people of the state residing in the border areas had been maintaining trade relations with the neighboring countries though in traditional and unregulated manner. People inhabiting in the border areas with Bhutan and Myanmar have been maintaining unregulated trade relation till today though trade relation with China was discontinued after Sino-Indian conflict in 1962. 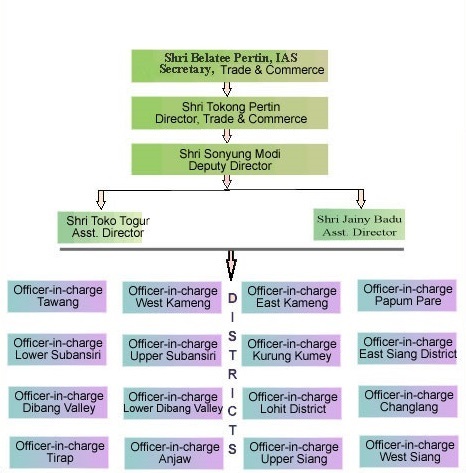 The Government of Arunachal Pradesh has identified the following border trade points and further development of infrastructure is under active process in Indo-Myanmar and Indo-Bhutan sector. 1	Pangsu Pass (Nampong) in Changlang District (Indo-Myanmar Border). 2	Bleting (Namtsering) in Tawang District (Indo-Bhutan Border). 3	Dongshengmang and Bongkhar in Tawang District (Indo-Bhutan Border). 4	Kenzamane (Zemithang) in Tawang District (Indo-China Border). 5	Bumla in Tawang District (Indo-China Border). 6	Gelling (Kepangla Pass) in Upper Siang District (Indo-China Border). 7	Kibithoo in Anjaw District (Indo-China Border). 8	Mechuka (Lolla Pass) in West Siang District. 9	Monigong (Dumla Pass) in West Siang District.